The Corporate & Community Site Index cratered this week, dropping an astounding 42 points as TheDryDown sank 30%. 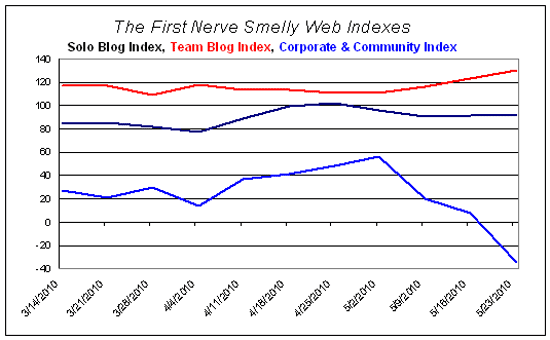 The CCSI is now in negative territory: a first for any Smelly Web Index. 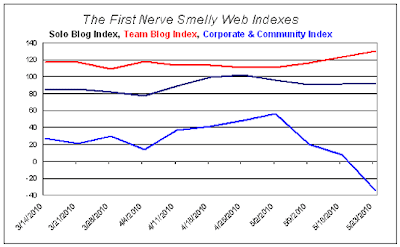 The Team Blog Index rose eight points as all five sites registered gains in ranking. The Solo Blog Index was unchanged with only two big movers offsetting each other: OlfactaRama continuing its climb back from the depths and IndiePerfumes sliding back into the ditch. Unlike recent weeks, most sites moved in a narrow range of less than ±5%. Just break the news gently when I crash back down to earth, m'kay? I'm thinking I might need to acquire a teammate if I'm going to play this game properly . . .